Fans who were blown away by Rachel Podger's acclaimed Bach and Telemann recordings have no doubt waited with baited breath for her to work the same magic on Mozart's sonatas for keyboard and violin. That these sonatas are largely -- though not always -- stacked against the violin is not an impediment to enjoyment, nor is the quirky quality of the fortepiano an obstacle: Podger is clearly the star of this recording, and her vivid playing always draws the listener's attention and admiration. Partly due to her strength and confidence, but also to the fascinating sounds she produces on her 1739 Pesarinius violin, Podger is always at the forefront and a delight to hear, even when Mozart gives her next to nothing to do. Even the tedious staccato arpeggios in the Andante of K. 6 are interesting here, proof positive that Podger can make music out of the flimsiest material. 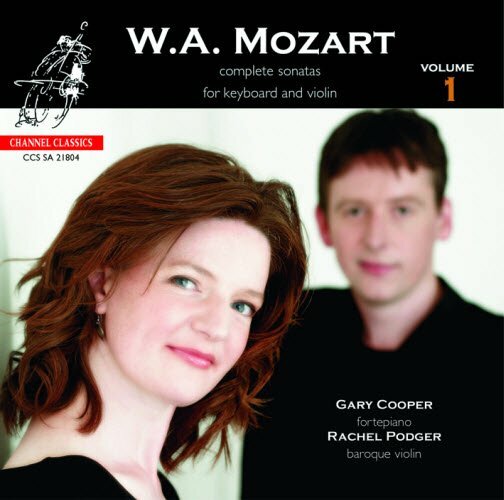 Gary Cooper is an enthusiastic partner to Podger, and his accompaniment is idiomatic and quite expressive; though the sound of the fortepiano may be an acquired taste for some, Cooper controls its timbres well enough to keep it from sounding too tinny or boxy. 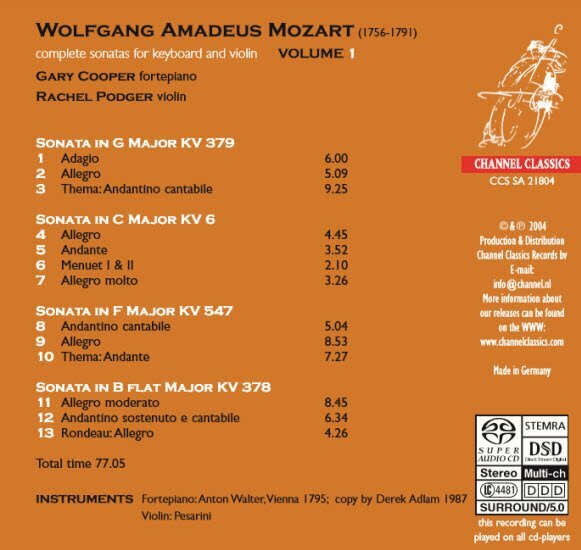 Channel Classics provides terrific sound on this SACD, though it is not compatible with some CD players, contrary to the label's claim.